​E*TRADE is one of the largest financial services companies in the United States. E*TRADE executed the first ever electronic trade by an individual investor over 30 years ago, so, therefore, it’s been at the forefront of the Internet and trading overall. It was founded in 1982, placing the first online trade in 1983. It’s been listed on the NASDAQ since August 16, 1996, and is headquartered in New York City. As you will find out in this E*TRADE review, this brokerage is also a bit different than other brokerages as they have a significant presence across the United States. You can find a retail branch if you live in major metropolitan areas. E*TRADE focuses mainly on retail trading and retail brokerage accounts, although it does have a little bit better pricing for active traders, although this is not one of its strengths. High-frequency traders and day traders will probably find cheaper options with Interactive Brokers and Lightspeed Trading. If you’re looking for a great place to invest for your retirement, then E*TRADE fits the bill. It’s got a great wealth of knowledge built into the platforms and the website and caters to those looking for a longer-term type of investment. E*TRADE has a vast suite of products that investors can access, giving them the ability to diversify their portfolio within the borders of the United States. As already said, E*TRADE is not necessarily built for day trading. However, if you are looking for plenty of analysis and information as to where to put your money away for the long haul, you’d be hard-pressed to find a much more clear, succinct, and useful place than E*TRADE. 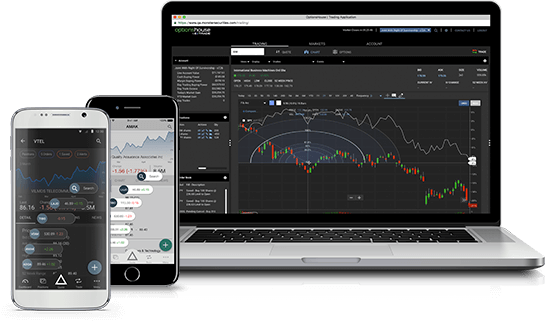 OptionsHouse by E*TRADE is a powerful platform for active traders offered by the brokerage (E*TRADE acquired OptionsHouse some time ago). 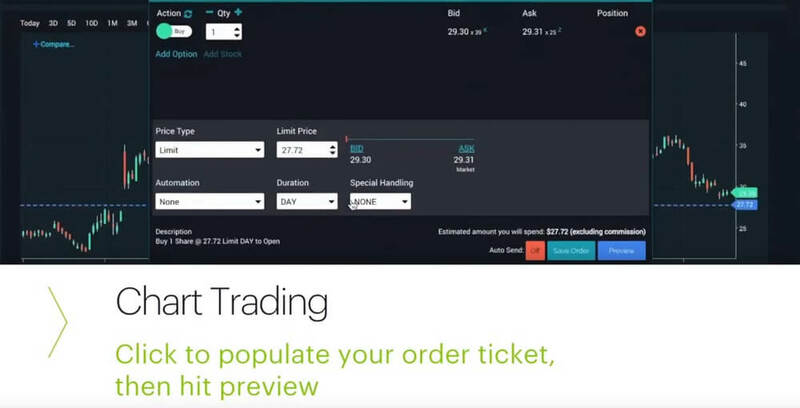 With E*TRADE you can trade stocks, options, ETFs, and the futures. They offer offers professional generation tools, including the ability to customize options chains and trading ladders. It also has excellent charting, featuring both intraday and historical charting with over 100 studies, and 30 drawing tools. There are multiple chart types available. E*TRADE Web Platform is the original place that they have offered to invest online and still one of the best platforms. It includes all of the tools that any trader or investor needs to research investments, track the markets, place trades, and pick up their skill set. It features third-party analyst research, quotes, news and of course charts. There are also stock screeners for the investor to spot opportunities. However, with up to 500 scans, Trade Ideas is still the ​A.I. powered market leader. There are also educational and retirement planning resources available. The E*TRADE mobile app allows you to expand your trading to mobile phones and is thought of being a companion to the powerful OptionsHouse trading platform. ​OptionsHouse by E*TRADE (eTrade aquired OptionsHouse in 2016 (press release | OptionsHouse Review). E*TRADER mobile platforms are presented as innovative and powerful, again made by traders for traders to be user-friendly and giving unlimited access to one’s account, to the markets and to all kinds of information where ever and whenever. ​E*TRADE allows the trading of stocks, futures, options, mutual funds, bonds, ETFs, and even prebuilt portfolios. These all center on the United States markets as it is an American brokerage, meaning that the stock markets, options, mutual funds, and ETF markets will all center around New York City. While you cannot trade foreign markets, there are ADR capabilities, meaning American Depository Receipts, and other words foreign companies that trade at places such as the New York Stock Exchange. This provides plenty of opportunities to build your wealth, especially over the longer-term. ​Stocks – Learn all about selecting, analyzing and trading stocks belonging to the fundamental investment options in the business. ​Retirement and Planning – learning how to build and how to maintain a secure retirement, college savings, taxes etc. for you may create the perfect financial plan for your future. Another major difference to other brokerages is, that E*TRADE operates an own bank. The online broker states that this is meant to maximize the value of the deposits that are generated through their brokerage business. E*TRADE even offers multiple account types, such as a typical brokerage account, retirement account, managed portfolios, small business accounts, and even banking accounts that include a premium savings account, Max rate checking, and E*TRADE checking, covering you in multiple different ways. For example, at the time of review, E*TRADE was offering interest rates over 15 times the national average. The managed portfolio situation at E*TRADE is huge and diverse, giving you the ability to have core portfolios, dedicated portfolios that are customized for you, and even fixed income portfolios. All of these are ran by top-notch managers that fall under the auspices of the appropriate regulatory bodies within the United States. E*TRADE has a relatively straightforward pricing scheme. 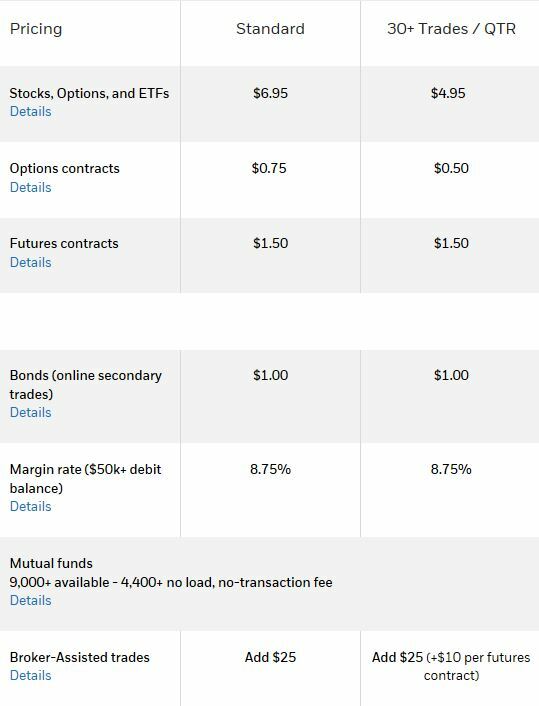 Stocks, options, and ETF trades are all charged $6.95 per execution, meaning $13.90 round turn. Because of this, it is rather expensive if you are looking to become an active trader. However, if you have more than 30 trades per quarter, then the cost gets reduced to $4.95 per side. Options contracts are $0.75 per side, meaning $1.50 round trip, but gets knocked down to $0.50 per side if you bake more than 30 trades per quarter. Futures contracts are $1.50 per side, with a total round-trip charge of $3.00. Bond trades are $1.00 per side, or $2.00 round-trip. Out of all of the commissions, E*TRADE seems to have the best pricing on futures contracts oddly enough. E*TRADE advertises with the slogan: Trade more, pay less. 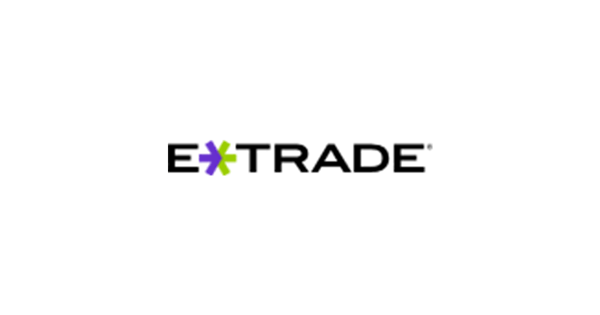 Being a retail brokerage firm, E*TRADE offers a lot of education and commentary. There is a huge section of education topics, thematic investing, markets and news, and commentary. This broker is focused on helping the average retail trader get involved, but not necessarily the active one. There is a nice section on getting started, stocks, options and futures, ETFs and mutual funds, bonds and fixed income, retirement and planning, tools and platforms, and stock plans. They also can invest in themes, such as clean energy or artificial intelligence. This is for the sociologically conscious trader that may be trying to invest in companies that are doing good for the social betterment. There has been a push into investing in companies that are good stewards of the environment, or sociological issues, and E*TRADE, of course, is at the forefront of that, offering their clients a way to take advantage of this. Beyond that, there is an excellent news service that E*TRADE offers, giving you a recap of the day and what’s going on overall with the stock markets. There are major indices that are followed, as well as major stocks such as Apple, IBM, or the like. There is a top stories section, and of course the latest news. Beyond that, there are analyst recommendations and a list of the most active stocks on the NYSE, NASDAQ, and more. Some of these analysts are also featured on the largest financial channels. They have been trusted for years by the general trading public. There is also a market calendar that let you know what’s coming up such as CPI figures, GDP announcements, and earnings announcements for individual companies, particularly useful during earnings season. Beyond the calendar, there are several other life events that E*TRADE will hold occasionally. As for customer service, there is an FAQ section, downloadable forms, and applications, financial consultants that are available either in person at your local E*TRADE branch, by phone, or online chat. There are also phone numbers with real people that you can talk to. They are divided up between retirement specialists, E*TRADE securities, stock plans, and designated brokerage services if you happen to be running an account for your employees. You can also email them, as well as mail through the U.S. Postal Service. E*TRADE is a brokerage that has a simple mission: simplify investing for the average investor. It’s not necessarily a place where a professional trader is going to put a lot of money and, because quite frankly the commissions are too high. However, options traders should consider taking a closer look at E*Trade. Because traders can fall in love with the nice features E*Trades provides with their trading platform. However, if you are not an experienced day trader, then you might be interested in E*TRADE because of the massive amount of educational and informational products that are on hand. Mitigating some of the trade costs, E*TRADE offers commission-free trading at the beginning of your account life, but this is a variable offer and can change at any time. You will need to consult the website before making your decision based upon that. If you’re looking for a brokerage that you can build a retirement account and, then E*TRADE may be the place for you. It has investment calculators that take into account a lot of it will be issued for the average consumer. They are giving you an idea of how much you need to save, when you need to start, and where you will be when you plan on retiring. It also gives you the ability to keep up with the latest news and is quite sufficient for investors that may only be placing a few trades occasionally. It is heavily regulated being in the United States, of course, so all of the usual protections will be part of working with E*TRADE. This, of course, is paramount, because you can relax as your money is insured.